Nike's marketing pitch: Lasting comfort and a responsive, streamlined feel. Upper: Engineered mesh, Flywire cord induced lacing. Midsole: EVA foam, Zoom Air bag inside the heel. 10 mm heel offset. Outsole: Firm, sticky Carbon rubber. 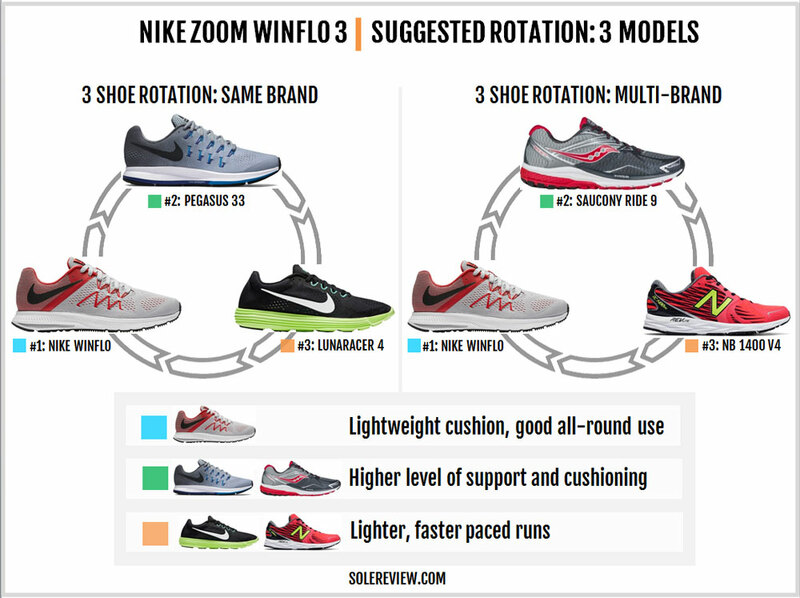 The Zoom Winflo 3 is a cushioned neutral trainer which is surprisingly lightweight, and offers some of Nike's signature tech at a value-for-money price. Nike shoes priced above $100 are often in the limelight, but the Oregon-based brand’s product assortment goes a few levels deeper. There are more running shoe models below $100 than above, even if they always don’t make the headlines. The Nike Dart 12, as the numbered suffix suggests, has been around for more than a decade. The Dart is the price of entry into Nike’s running line, and puts together a reasonable material package. There isn’t any fancy tech employed on the Dart. The latter uses a plain, injection-molded EVA foam midsole attached to a basic upper made of regular mesh and synthetic leather. If you’re straining your ears for the sound of bells and whistles, then you certainly won’t hear it. There are other budget Nike models like the Downshifter 7, Nike Flex Run 2016 or the Nike Revolution 3 in the $60 ~ $80 price band. All these products cater to the family footwear channel, department stores, and their online equivalent. You’re more likely to come across these shoes on Kohl’s or Zappos than on Nike’s own website. 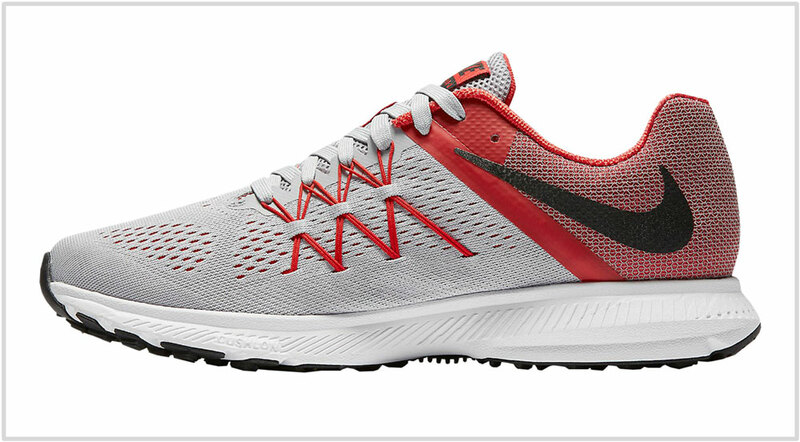 The Nike Zoom Winflo 3 is a model which bridges the gap between the $60 ~ $110 price range. 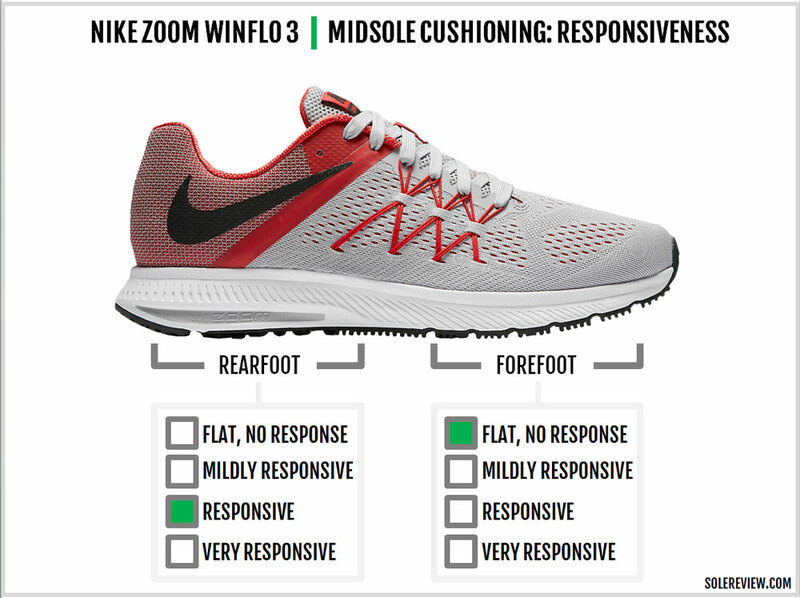 In more concrete terms, the Zoom Winflo 3 is half-way between the Dart 12 and the Pegasus 33. Differentiation comes in the form of a Zoom Air fitted EVA midsole – while maintaining a lower material spec than the Pegasus. On a tangential note, the term ‘entry-level’ is extremely subjective. The Winflo might be $75 in the United States, but in countries with high protectionist barriers (import duties), consumers have to pay a much higher price. For example, the Winflo sells for $120 in Brazil and India, which makes it a hyper-expensive shoe when you factor in the median wage. Even the well-heeled Australians pay $102 for the humble Winflo. Unlike mid and higher priced running shoes, the $60-$80 models have inconsistent retail distribution and visibility. Some brands limit the sales of these budget shoes only to specific channels like department stores. Other brands might adopt a region-centric approach; for instance, adidas sells a lot of entry-level models in India which are not found elsewhere. But for this exercise, we’ll limit the assortment subject to its availability in the United States. On the surface, New Balance’s focus seems to be on its Fresh Foam assortment. But as you trawl the Interwebs, you’ll discover that New Balance is a closet budget shoe brand. There’s the traditional looking mesh-foam-rubber 680V4, followed by the 1080 inspired 720V4. The 775V2 uses a no-sew upper atop an all-foam sole, while the cheaper 560V6 is another traditionally designed shoe. If this wasn’t enough, you have the 790V6, the 818, and the 675V2. The cheapest of all is the New Balance 450, which officially retails for $60 but is usually had for far less. Why does New Balance have so many budget shoes? One theory is that the pre-Fresh Foam era was all about comfortable white, gray and brown New Balance shoes, which made the brand mainstream in a casual, department store kind of a way. So if that sales channel has historically resonated with shoppers, why spoil a good thing? 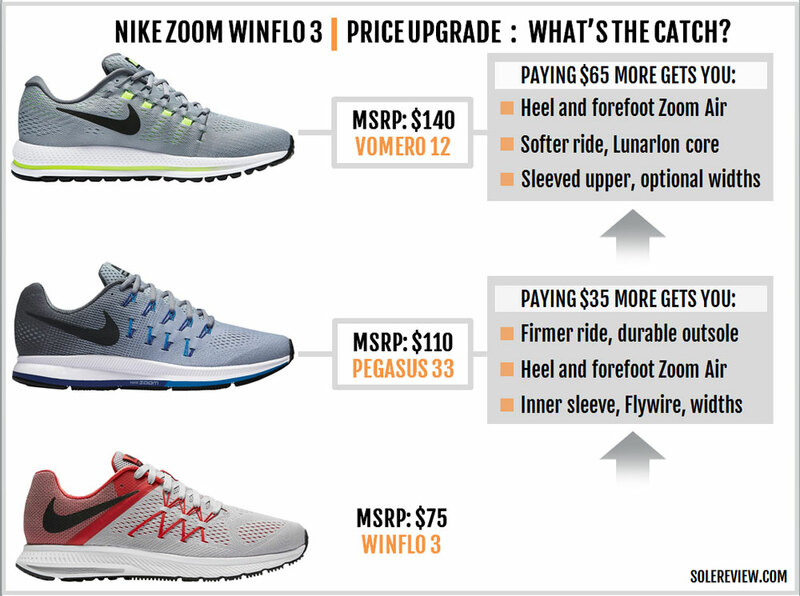 Other brands sell cheaper running shoes, though not on the same scale as Nike or New Balance. Asics’s Gel Contend 3 is a popular model, and the Saucony Cohesion 10 has been around for a while. The Energy Cloud 3 and the Mana Bounce are budget shoes from adidas. 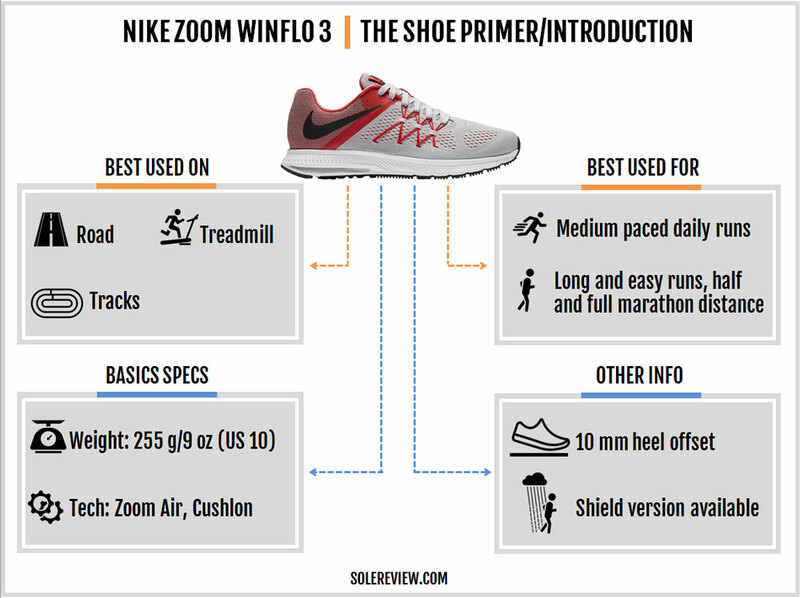 Most of these shoes are very different from the Winflo and can hardly be termed as ‘similar shoes.’ The infographic above merely serves as an approximate reference while exploring other options. 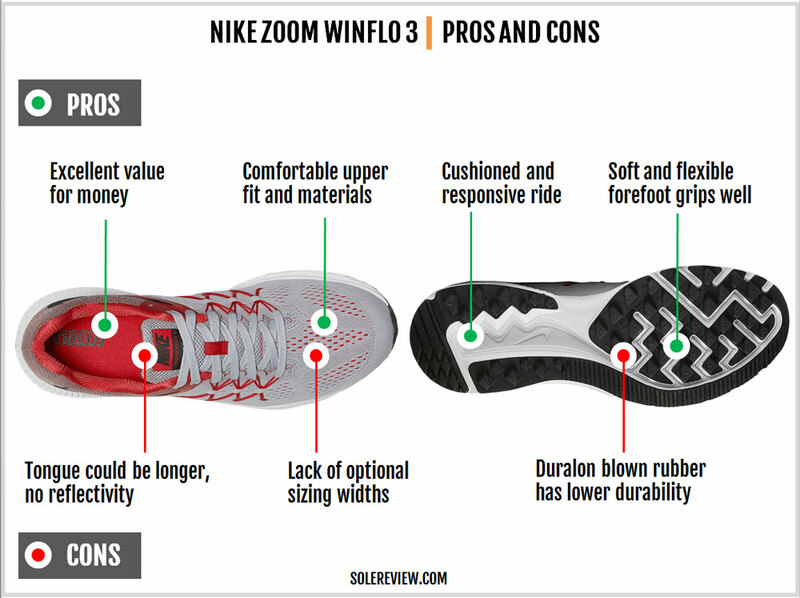 The Zoom Winflo 3 has a minimally constructed upper, using an engineered mesh for the forefoot and midfoot and a regular mesh over the rear. As befits an engineered mesh design, the surface has a lot of vented areas along with densely woven zones for structural support. The tongue is made using a spacer mesh with a degree of in-built sponginess. There’s no sleeve attached to the tongue, so it tends to slide sideways during runs. There are no stitched layers on the outside. Nike relies on welded overlays over the eyestay, and the two different upper meshes are joined by a fused seam panel. The inside of the Winflo has a separate lining, one which not only adds reinforcement to the upper, but has a bearing on the quality of fit too. The eyelets are hooked up with four columns of external Flywire loops. The cords begin their journey at the base of the upper (between the outer and inner mesh), and then extend outwards. The laces have a flat design and have a puffy feel to them. The heel is padded with Nike’s favorite mesh lining, which has served long on earlier versions of the Pegasus and the Vomero. 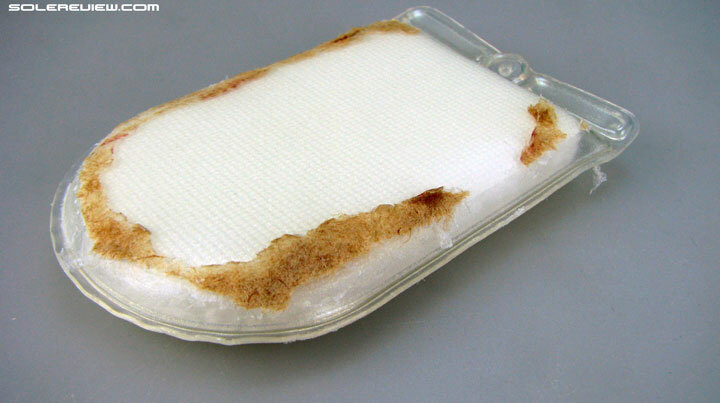 The lining has a soft hand-feel and is padded with foam for comfort. Instead of an external toe bumper, the Winflo’s toe-box has an internal stiffener for shape and dedicated room. That’s also paired with an internal heel counter at the rear. For a shoe which retails at $75, the midsole packs in a surprising amount of Nike’s proprietary tech. The foam used is Cushlon, a softer EVA (Ethylene Vinyl Acetate) foam variant which Nike also uses on its more expensive Vomero. 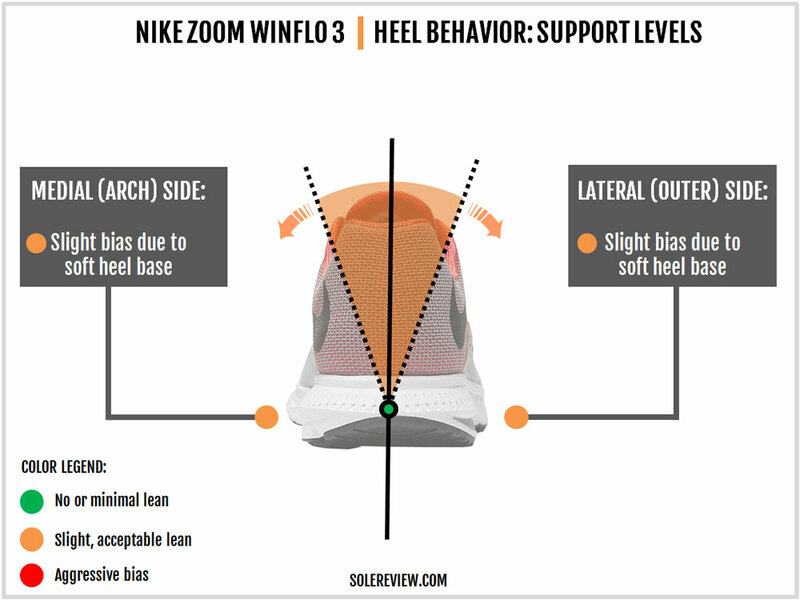 Not only that, the heel has a Zoom Air bag. Which is remarkable considering that until last year, even the Pegasus had a single heel Zoom Air bag. 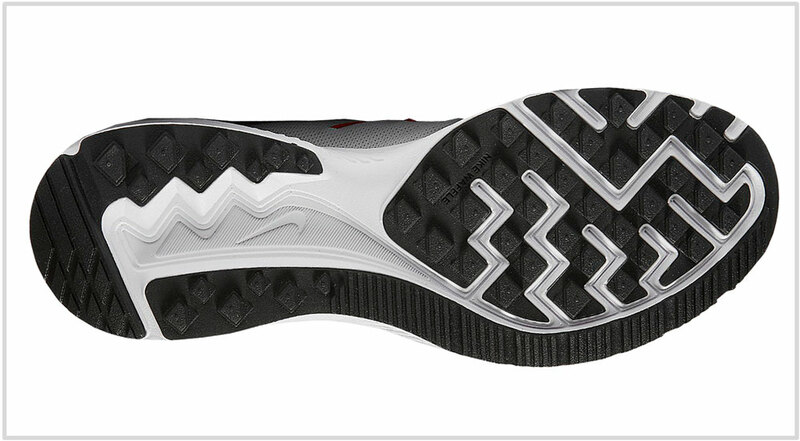 The rest of the midsole has an uncomplicated design. It is single density from heel to toe, and the lower sidewalls near the heel have ridges for compression. The Winflo weighs only 9 ounces for a half pair of US 10, and that’s at odds with the copious amounts of sticky rubber used on the outsole. Save for the rearfoot cavity which has exposed midsole foam, most of the underside is clad with rubber. Though the outsole eschews the use of soft blown rubber, the forefoot outsole is generously segmented. There are multiple flex grooves under the forefoot, and strips of rubber have exposed areas of foam between them. This design gives the Winflo forefoot excellent flexibility and a soft ride. The midsole and outsole jut out under the heel edge, and a deep flex groove carves out a crash pad. 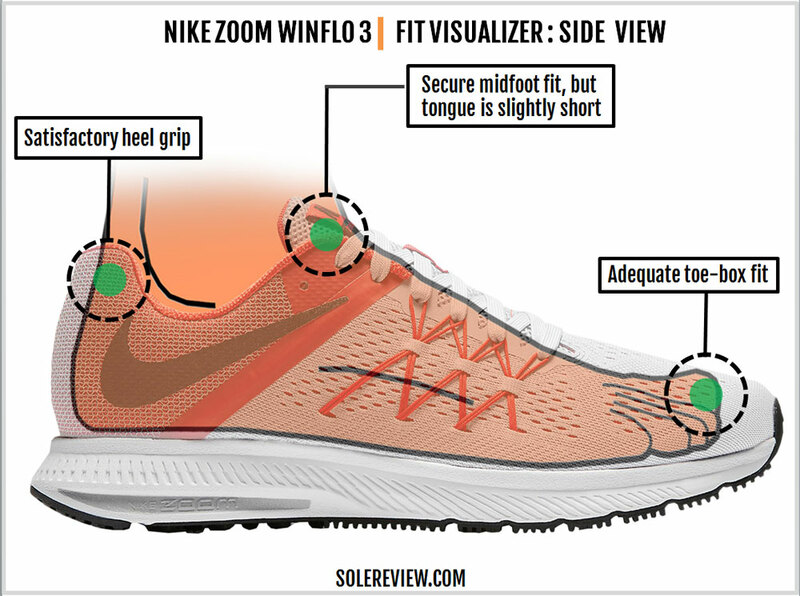 This design aids rearfoot landings and also influences the Winflo’s cushioning character. Don’t expect the Winflo to last as long as the Pegasus. Some of the Winflo’s attractive traits – like its lightweight build and grippy rubber outsole – comes at a cost. The outsole does an excellent job of gripping most surfaces, and understandably the softness comes with the trade-off of lower durability. The sticky outsole is the equivalent of a soft car tire; you’ll get all the grip you need, but at the cost of lower tire life. There’s Zoom Air bag in the heel, but nothing upfront. Cushlon, like all EVA-based compounds, will eventually lose its springy sensation. The Flywire cords and the thin outer upper mesh might (potentially) prove to be an issue, although we haven’t received reader complaints so far. The Winflo’s upper fit will remind you of the Pegasus. The toe-box is shallow but doesn’t prove to be an impediment, and soft mesh-lined heel pads and grips well. You’ll miss the sleeved midfoot design which is featured on many Nike shoes, for the Winflo’s tongue doesn’t have one. There’s mild tongue slide, and one also wishes that the tongue was slightly longer (in the case of heel-lock lacing) and better padded. The external Flywire do a decent job at midfoot lock-down, and the insides are smooth courtesy of the additional lining under the outer mesh. While the forefoot doesn’t come with abundant space, it doesn’t feel cramped either. Ditto for the toe-box width, no complaints there. The all-mesh and no-overlay design delivers a fit consistency throughout the forefoot. The midsole is made entirely of Nike’s soft EVA foam which they call Cushlon, and there’s a Zoom Air bag inside the heel. And right under the foot, there’s a soft insole. Turn the shoe over, and you’ll see a foam cavity which compresses upon landings. Under these circumstances, the Winflo’s soft ride character is a predictable outcome. 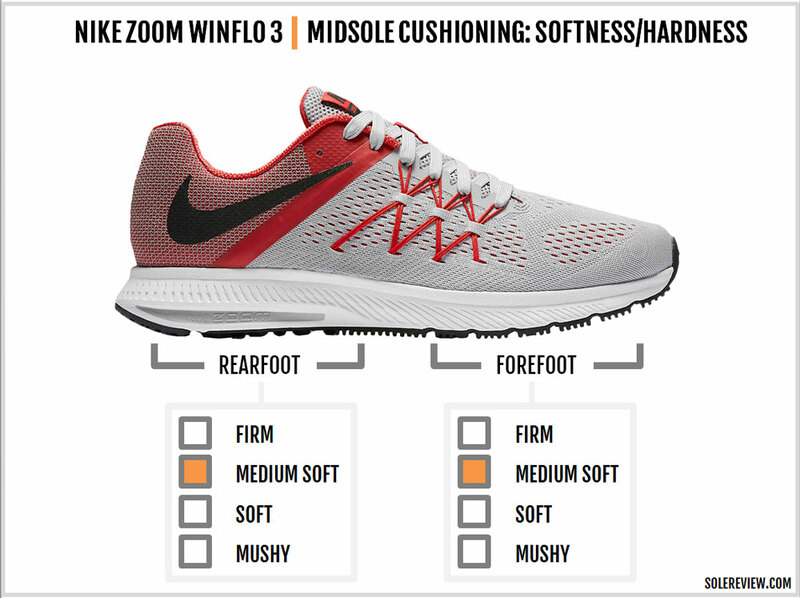 Given that the Cushlon foam is the same as the one used on more expensive Nike shoes (like the Vomero), how does the Winflo’s ride differ? A noticeable lack of thickness would be a simple way to describe the difference. 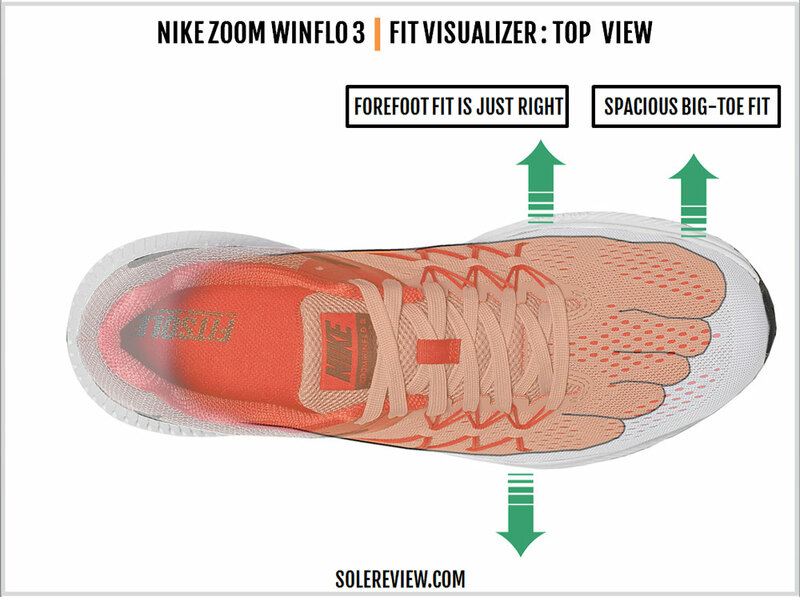 The Winflo’s midsole does not have the heft or sensory depth of other models. While you feel the softness, you are also aware of the thinness of the midsole. A watered-down Vomero of sorts, if you will. That difference aside, the Winflo’s softness isn’t mushy. Put a Zoom Air bag inside a Cushlon foam midsole, and a bouncy sensation follows. The Winflo’s heel feels responsive or spring-like, as the tightly sprung Zoom bag unit compresses and snaps back during transitions. 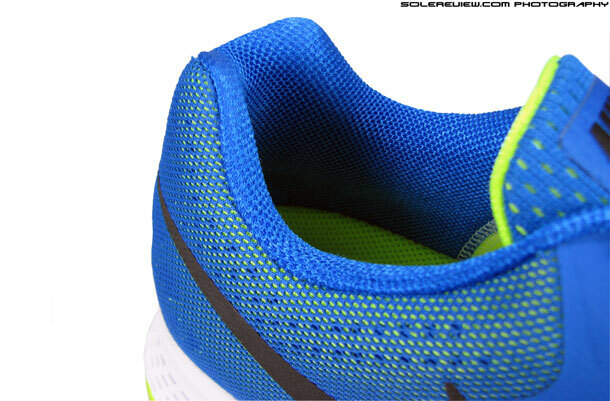 Regardless of the entry level price, the Zoom Air bag covers a large area under the heel. The forefoot just has foam, so it lacks the bouncy ride of the heel. The ride sensation is relatively flatter as a result, though the Cushlon foam delivers some responsiveness early in its life. As far as stability is concerned, the Winflo 3 performs satisfactorily. The midsole heel is soft and is ridged on the lower sections, so there’s a bit of compression lean on both sides. The forefoot feels planted and supportive. The midsole is soft, but at the same time, the Winflo’s ride has a lower-to-the-ground feel. This helps make transitions efficient, though not at the same level as a firmer shoe. 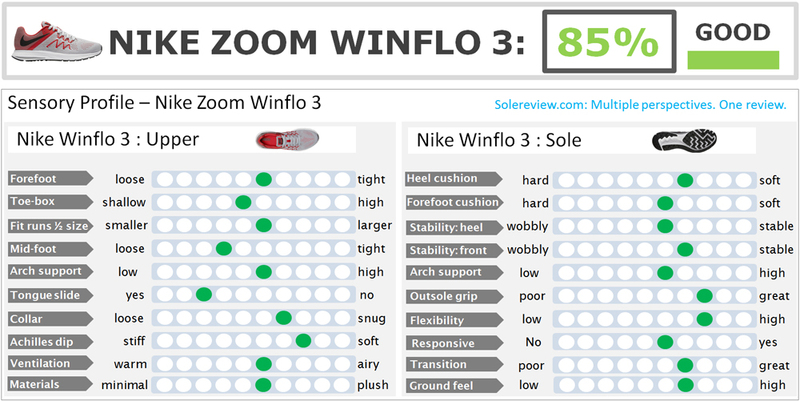 The Winflo feels reasonably fast, but if you need more pep, then consider the Lunaracer 4 or the Streak 6. A retail price of $75 makes the Winflo 3 a great value-for-money purchase. The upper fits well, and the midsole features components usually found in pricier Nike shoes. The Winflo’s ride is cushioned and responsive, and the shoe weighs far less than one would expect. The outsole rubber coverage is generous given the shoe’s weight, and the sticky compound has an assuring grip. The Winflo 3 gets most of the things right, but there are a few areas where it could do better. The Winflo lacks additional widths and as well as night-time reflectivity. 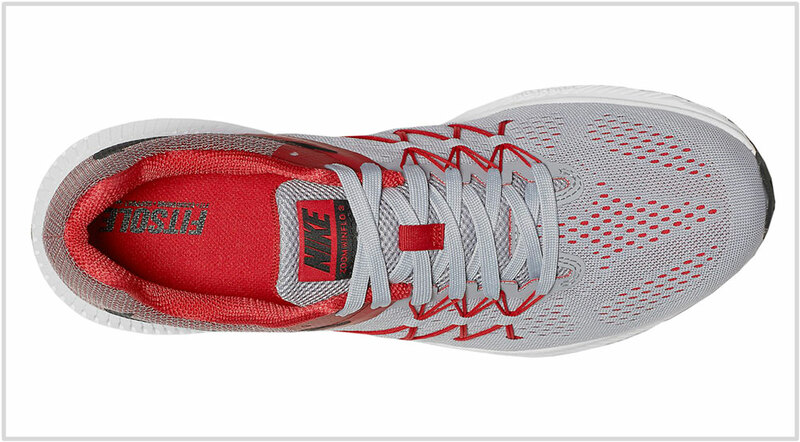 Also, the outsole will not last as long as other Nike models such as the Pegasus. Ok, the Winflo 3 will do perfectly well if you need just one shoe to do it all. It is cushioned enough for long runs while being lightweight for faster workouts. But if you want a few other shoes, solereview is here to help. The Nike Pegasus 33 is a dependable high mileage hauler. The dual Zoom Air fitted midsole makes long runs easy, and the rubber outsole has a lengthy lifespan. The sleeved upper fits well, and its $110 retail price doesn’t break the bank. 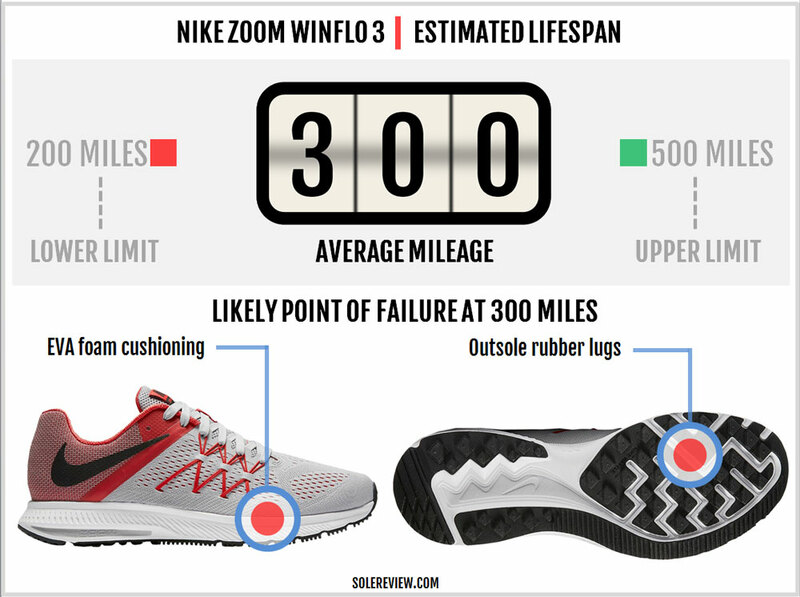 The Winflo does fast well, but what if you wanted an even lighter shoe? 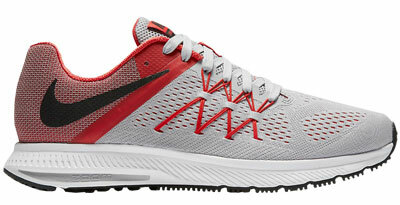 The cushioned Lunaracer 4 or the firmer Streak 6 perform well as dedicated race-day shoes. The Saucony Ride 9 is a Nike Pegasus 33 equivalent, and comes with a slightly firmer ride and a narrower upper fit. The New Balance 1400V4 has proven time and again to be an excellent speed shoe. 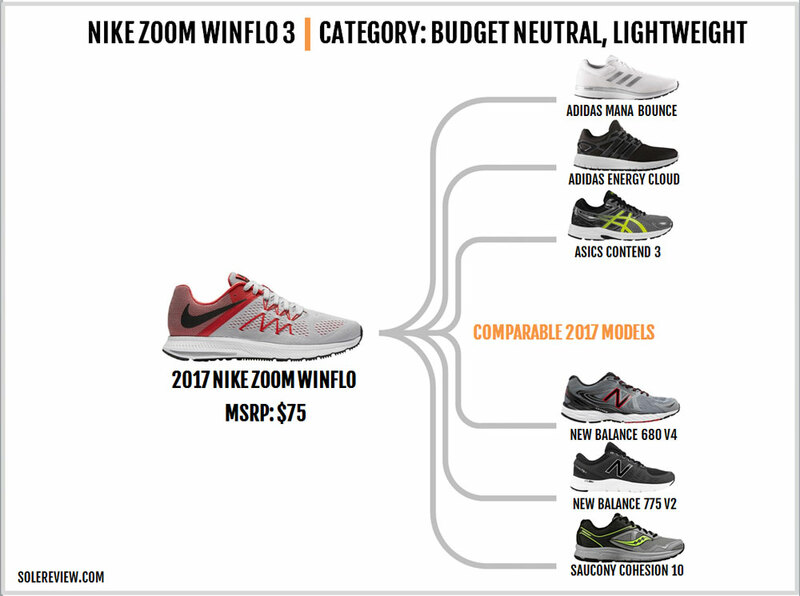 Within Nike’s realm of neutral running shoes, the Zoom Winflo 3 resides below the $110 Pegasus 33 and the $140 Vomero 12. We’ve summarized the Pegasus in the rotation section above, so we’ll just talk about the Vomero 12. The Vomero 12 has been released earlier than usual, which otherwise happens to be around April. Nike’s flagship neutral cushioned trainer is packed with new updates. In addition to the heel and forefoot Zoom Air bags, the midsole has a softer Lunarlon core surrounded by a single density EVA foam. There’s a brand new outsole underneath too. The Vomero 12 upper retains the engineered mesh template, and adds a variation to its Flywire loop design. At nearly 12 ounces, the Vomero is 3 ounces heavier than the Winflo but more cushioned.